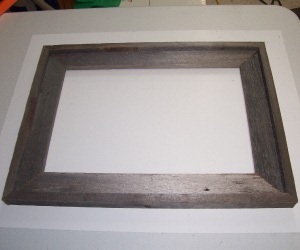 Rustic picture frames is a great use for old fence boards, and it is a much better than throwing them away. Since fence boards are naturally weathered, they make an excellent material for creating rustic home furnishings and other small woodworking projects. 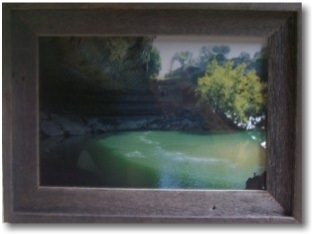 The goal of this project is to build a rustic cedar picture frame around a 12" x 18" enlarged photo. The finished picture is shown above. Pick out a couple of straight used fence boards. 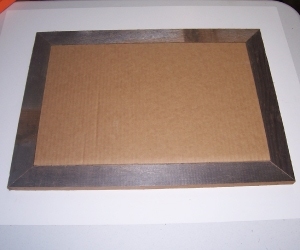 When making picture frames from fence boards, the used ones are the best. They have much more character than the new ones, and using them for another purpose after they have served their usefulness on the fence, provides continued value. 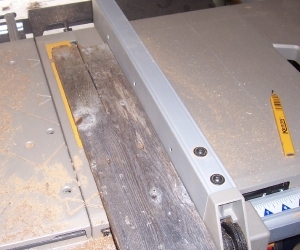 Using your table saw, rip both of the fence boards at around 2 inches. Both pieces of the rip will be used to build the frame. You should end up with one piece about 2 inches wide (the inside part of the frame) and the other piece about 1.5 inches wide (the outer part of the frame). 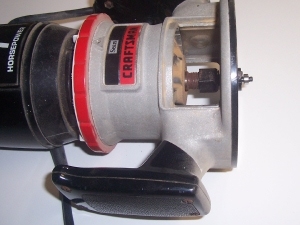 Insert a .25" rabbet bit in your router, and adjust the depth to .25". I use this size rabbet cut when making picture frames because the thickness of a 1/8" thick piece of glass and picture (which hardly has any thickness), and cardboard backing, when inserted into the frame, is almost flush with the back of the frame. You'll see this come together in some later steps. Make a rabbet cut along the entire length of both 2" wide rips (see image below). The rabbeted board will form the inside part of the frame. The glass, picture and carboard backing will fit into the grove. 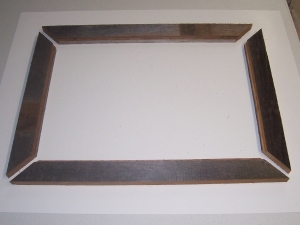 One of the most important steps in making rustic picture frames is to cut the frame the exact size that you want it. The key is to measure the frame parts from the points indicated below. First, determine the exact dimensions of the glass - you can cut the picture and the cardboard backing if needed, but the glass would be more difficult. Assuming that the glass is exactly 12" x 18", measure and mark your frame parts 12 1/8" and 18 1/8". 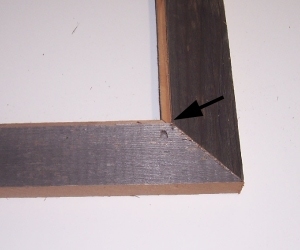 Using a miter saw, cut a 45 degree angle on each end of each piece (see diagrams). 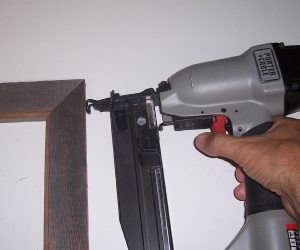 Once the frame pieces are the size that you want them, attach them using a finish nailer, such as the one shown below. 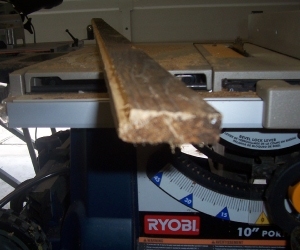 Next, using your miter saw again, cut the outer part of the frame (the 1.5" part). It should wrap around the inner part as shown below. Attach with the finish nailer. Once completed, the frame should appear as shown below. 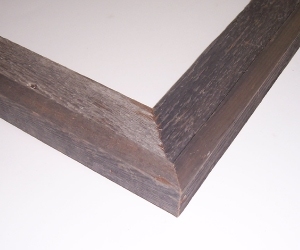 If both sides are the same length and the top and bottom are the same lenth, the frame corners should be square and the 45 degree joints should be tight. Next, cut a piece of cardboard to use as backing for the picture. The purpose of the backing is to hold the photograph tight against the glass, so that there are no ripples in the picture.